Panasonic Toughpad FZ-B2 Fully Rugged 7" Android 6.0 Tablet built for enterprise Tablet Mobile Computer 7" fully rugged Android tablet PC is ideal for industry sectors using light applications and looking to replace their ageing business PDA's, the FZ-B2 with its energy efficient and mobility-designed Intel Atom processor is an affordable and flexible mobile solution. With its capacitive, 10-finger multi-touch display flexible configurable ports and business expansion capability this Android™ 6.0 device can be used in the field whilst benefitting from connectivity options to ensure data is always available when needed. The fully rugged Toughpad FZ-B2 sets new benchmarks for performance, flexibility and manageability in an Android tablet designed for field workforces in challenging environments. With its capacitive 10-finger multi-touch outdoor display, highly flexible configuration options and long battery life, this compact and lightweight Android™ 6.0 tablet is ideal for mobile workers. With Android for Work and configurable, applications and custom images, it is also a secure and easy to manage Android device for IT administrators. The Toughpad FZ-B2 shares its DNA with the Toughbook family of products from Panasonic, combining ergonomic and durable design that has made Toughbook the first choice for field workforces. 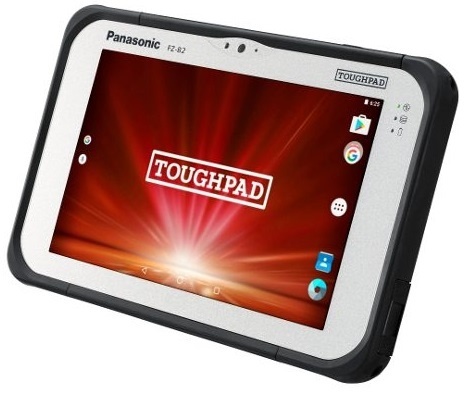 Panasonic has created the fully rugged, highly versatile Toughpad FZ-B2 to answer the needs of organisations that require Android™ 6.0 functionality. For organisations with a mix of Android and Windows devices, the Toughpad FZB2 shares the same peripherals, such as cradles, vehicle mounts, batteries and chargers as its Windows-based sister device the Toughpad FZM1.